DC Envelope Printer Doc v 2.0 - Bulk Mail Feature - Douglas Computing, Inc. Bulk Mail online help tutorial. When you open DC Envelope Printer for the first time, you open the main page of the app, in the app's Single Envelopes mode. You will see an image of an envelope in the middle of the page, with NO section selection buttons over on the left. To access the main page of the app in Bulk Mail mode, click on the Bulk Mail menu button at the top left of your screen. On the resulting page, you will see section selection buttons on your left, as well as a list box beside it. 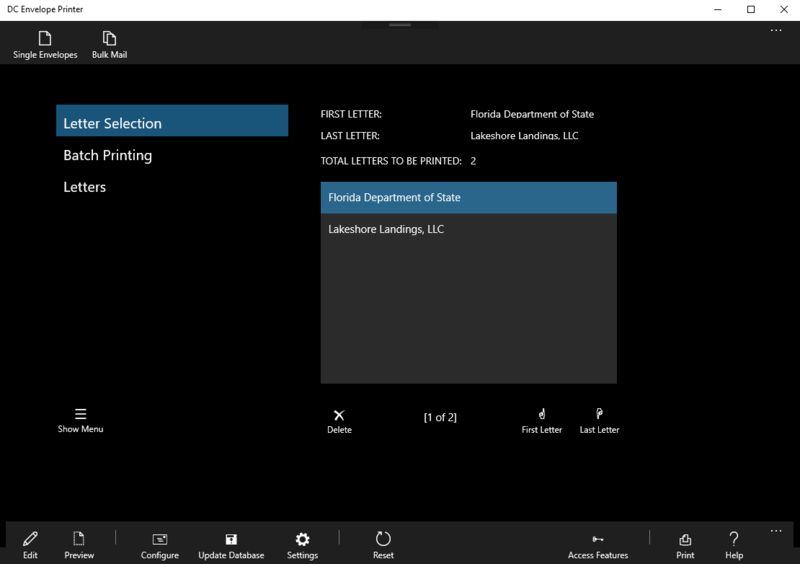 Clicking on the section selection buttons over on the left, takes you to the Letter Selection, Batch Printing, and Letters sections of the page. Please note, in order to use this feature you must have address records entered into the app's database. This feature works by filtering addressee records, in order to create mailing lists, which are then printed in bulk.